The fight for a U.S. Senate seat in 1984, pitting Democratic governor James B. 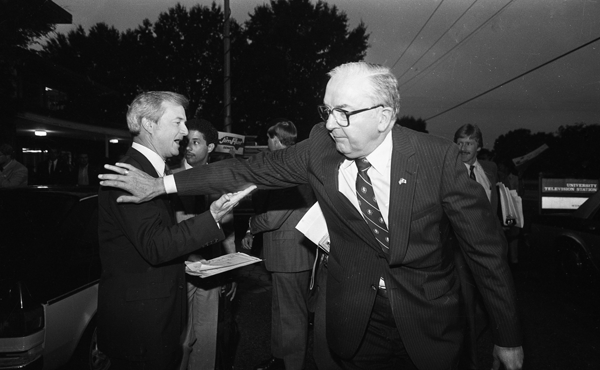 Hunt Jr. against incumbent Republican senator Jesse Helms, is considered one of North Carolina's most infamous political battles. The campaign received unprecedented national and international attention because of the use by both sides of negative media ads and brutal personal attacks. It is seen as a prototype of the no-holds-barred brawls that typify a strand of modern-day partisan politics, polarizing voters along distinct ideological lines. New York Times, Washington Post, Los Angeles Times, Wall Street Journal, and USA Today reporters consistently followed the campaign, as did print journalists from Canada, Great Britain, Sweden, France, Denmark, Switzerland, and Japan and German and Dutch TV reporters. The tremendous amount of money spent on the campaign (more than $25 million) contributed to this coverage. One ABC News anchor at the time called the race "the closest thing we have ever had to a national race for the U.S. Senate." Both Hunt and Helms were skilled campaigners who had fervent supporters and detractors in North Carolina. Many of Helms's admirers considered him a courtly, grandfatherly figure as well as a courageous conservative warrior battling the "tax and spend" approach and immoral values of liberal Democrats. Hunt's admirers touted his forward-thinking dedication to educational and economic progress in the state and approved of his pragmatic gubernatorial leadership and open-minded moderation on social issues. Helms saw his popularity begin to wane in the early 1980s, evidenced by several polls that showed him trailing Hunt by double-digit numbers. In April 1983, a full year and a half before the election, Helms began running radio and newspaper ads attacking Hunt, followed by TV ads over the next several months. These ads characterized Hunt, in highly unflattering terms, as a liberal, valueless, pro-union politician-a theme the Helms campaign continued throughout the race. That fall, Helms led a filibuster of a U.S. Senate bill to establish slain African American leader Martin Luther King's birthday as a national holiday. The ads and Helms's position as perhaps the staunchest conservative on the national scene bolstered his numbers in North Carolina, and within months he had pulled even with Hunt in the polls. 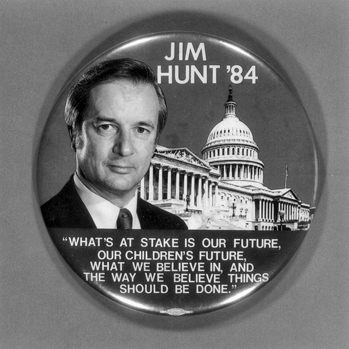 Hunt began to fire back with his own inflammatory attack ads beginning in May 1984, linking Helms to the acts of right-wing dictators around the world. With Hunt's entry into the media fray, harsh accusations and bitter rebuttals became the backbone of both campaigns. Among other things, Hunt accused Helms of supporting cuts in popular social programs such as social security and school lunches while backing efforts to pro vide tax breaks for the rich and oil companies, of trying to "divide our people" along racial lines, and of disrespecting veterans by calling veteran benefits "welfare." Helms accused Hunt of a variety of liberal views and agendas and called his patriotism into question for his lack of military service. After a long and bitter campaign, the election on 6 Nov. 1984 saw Helms win by a relatively wide margin of 52 to 48 percent. In the end, the election served to bolster the ever-hardening lines between the political right and left. Analysts of the election returns noted that Hunt carried nearly all of the African American vote and much of the college-educated, urban, liberal-to-moderate vote. Helms took a large percentage of the white middle-income, blue-collar worker vote and that of the loose coalition of Evangelical conservative voters who came to be known as the Christian Right. The campaign took a toll on the positive reputations of both men and, for all the national attention it received, temporarily damaged the state's political standing. In addition, the use of attack ads to point out the weaknesses of opponents became ever more commonplace, at least in part because of their effectiveness during the 1984 Helms-Hunt race. Frederick A. Day and Gregory A. Weeks, "The 1984 Helms-Hunt Senate Race: A Spatial Postmortem of Emerging Republican Strength in the South," Social Science Quarterly 69 (December 1988). Michael R. McLaughlin, "Hunt Versus Helms: Old Time Politicking in the New South" (M.A. thesis, UNC-Chapel Hill, 1984). "HELMS, Jesse, (1921 - 2008)." Biographical Dictionary of the United States Congress. http://bioguide.congress.gov/scripts/biodisplay.pl?index=H000463. James Hunt and Jesse Helms attending a debate July 29, 1984. Copyright News & Observer, all rights reserved. Used with permission. Housed at the N.C. State Archives, call no. NO_042184_Fr39. Campaign button from the unsuccessful 1984 U.S. Senate bid of James B. Hunt. North Carolina Collection, University of North Carolina at Chapel Hill Library.